Graham Hughes is the first man to visit all 201* countries in the world… without even taking a plane. He is 33 years old and comes from Liverpool, England. Hughes has a strong passion for adventures and in his search for new ones, he managed to take a dip in all of the world’s cultures. Read along to learn more about his incredible experiences. Hughes’s goal to see the whole world without flying was not an easy job. He travelled 160,000 miles in 1,426 days (around 3 years and 11 months) with only $100 a week. Although his journey wasn’t an easy one, he shares some incredible stories about what he had to go through. In order to reach Cape Verde, he had to go through open ocean in a “leaky boat” for 4 days. He was also arrested for espionage in Congo where he spend a week in jail. But that wasn’t his only encounter with the authorities. He was arrested in Russia for attempting to “sneak into” the country and then he had to be “rescued from Muslim fundamentalists by a Filipino transsexual named Jenn.”, he writes in his blog. Hughes shares that he has a strong love for travelling and the reason behind his big adventure was that he just wanted to see if it was possible to be done by one person on a tight budget. One of his aims was to prove that the world isn’t a bad and scary place. On the contrary, he shares that it is full of nice people who are ready to help even though you are a total stranger. 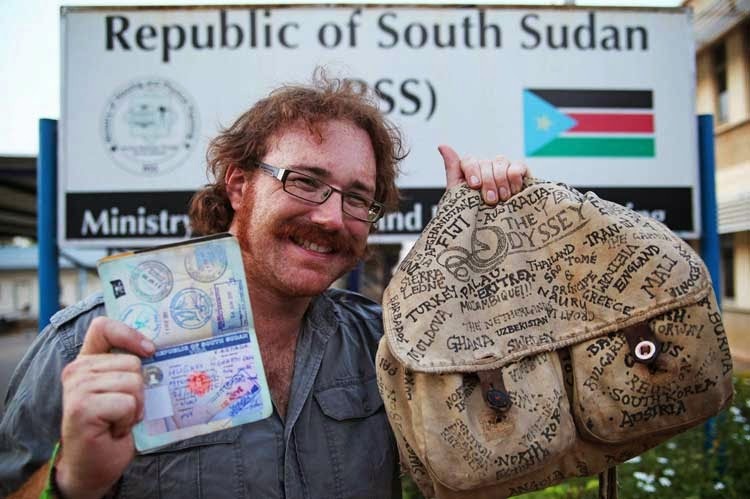 Hughes is now officially a world record holder for “Most countries visited in one year by scheduled ground transport”. He has his whole journey filmed for a documentary and has raised money for charity WaterAid. For most of the longer voyages he counted on the nice crews of cargo ships to take him on board with them. On his way to the Dominican Republic, he even got a lift on a friendly cruise ship. Graham Hughes has had amazing experiences in those travelling years. Some of them include making friends with orangutans in Borneo, meeting the Prime Minister of Tuvalu and dancing with the Highlanders of Papua New Guinea. Many people have asked Hughes if it was hard to get into countries like North Korea, Afghanistan or Iraq but he shares that they were the easy ones. Getting to smaller island countries like Nauru (which is in the heart of the Pacific Ocean), the Seychelles and the Maldives was harder for him and he even says that “there were sometimes pirate threats”. Hughes says that there were some really tough moments through his journey. One of them was “sitting in a bus station in Cambodia at one in the morning or riding some awful truck over bad roads”. But the hardest part of his adventure was when his 39- year old sister, Nicole, died of cancer. He stopped his trip and went to see her in hospital when he had only 17 countries to go. In a hard moment like that, he thought about quitting his travelling, but after his sister encouraged him to complete his goal, he had new strength to continue, so, he did. Hughes now shares that he doesn’t plan to buy a plane ticket any time soon because he loves the trilling experience of the adventure. *Depending on the source you are looking at, there are between 189 and 196 countries in the world, but he also visited some places that are not recognized as countries by UN and other international organizations.